Fourth Row Center: Film Writings by Jason Bailey: On DVD: "John Lennon and the Plastic Ono Band: Live in Toronto '69"
On DVD: "John Lennon and the Plastic Ono Band: Live in Toronto '69"
The concert film John Lennon & The Plastic Ono Band: Live in Toronto ’69 (originally titled Sweet Toronto —still seen in the opening titles of the film proper) had a bit of a checkered history on its way to home video. Directed by acclaimed filmmaker D.A. Pennebaker (Monterey Pop, Don’t Look Back), it captures John Lennon, Yoko Ono, and their Plastic Ono Band (a label they applied throughout the 70s to whatever group of musicians they were appearing with) at their first on-stage appearance, as part of the Toronto Rock and Roll Revival show. That September 13, 1969 show was a one-day festival spotlighting rock legends of the fifties (including Chuck Berry, Bo Diddley, Little Richard, and Jerry Lee Lewis) and the modern acts they had influenced (including The Doors and Alice Cooper). The show’s organizers reportedly asked the Beatles to join—a Hail Mary at best, as the group hadn’t appeared in concert for three years. John, however, was intrigued, and when the band (well-splintered by this time) declined, he decided (at varying degrees of the last minute, based on whose reporting you believe) to throw a band together and go do the gig—partially for fun, partially to see his idols and introduce Yoko to their music. The show was in important one for Lennon; his appearance on-stage with a new group was yet another clue that the Fab Four were on the way out, and the performance proved a bit of a roadmap for the kind of music we’d be hearing from him for the next several years (for better or worse). Though the band’s performance was released as an album in December of that year, various unofficial deals and Lennon’s unhappiness with his physical appearance in the footage caused the film to sit the Pennebaker vaults until the late 1980s, when it was finally seen on Showtime and released on VHS with a brief prologue interviewing Ono at a 1988 Lennon art exhibition in London. “Okay,” Lennon announces at the top of the set, “we’re just gonna do numbers that we know, because we’ve never played together before.” And with that, the quartet launches into a scorching series of rock and roll standards. Lennon looks a little nervous at first, but the band’s cover of “Blue Suede Shoes” is rougly passionate and gives Clapton his first opportunity to rip up a solo. Their bristling, heavy cover of “Money” is darkly effective, and the set’s highlight is “Dizzy Miss Lizzy,” which finds Lennon in terrific voice and is augmented by another wickedly satisfying Clapton solo. So far, so good. The problem, at risk of sounding like every other Beatles fan ever, is Yoko Ono. During the first three numbers, Ono is only present long enough to disappear into what appears to be a large, white, cloth bag—odd, but hey, it’s Yoko. Then she emerges for the group’s performance of Lennon’s gritty barn-burner “Yer Blues” (from the White album), and starts screeching along with the song, and you immediately wish she’d go back into the goddamned bag. She does similar damage to Lennon’s just-recorded “Cold Turkey,” which he introduces by noting, “We’ve never done this number before, so best of luck”; the version performed here has a smoother, more streamlined instrumentation, missing the record’s distinctive main guitar riff. Yoko screams along, John has to reference the lyrics from Yoko’s notes, on the whole thing kind of breaks down at the end. Her vocals aren’t as intrusive on “Give Peace A Chance,” due primarily to the sing-along nature of the song, but when that number concludes and John announces, “Now Yoko’s gonna do her thing,” do whatever it takes to find the remote and shut the disc down. We’re subjected to a five-minute version of “Don’t Worry Kyoko (Mummy’s Only Looking for Her Hand in the Snow,” and it’s downright cringe-worthy; as the quartet plays along with her horrifying caterwauling, about the only entertainment to be found is reading Clapton’s expressions (he clearly sees that the set is going down the tubes). At least they’re playing, though—the show closer, “John, John (Let’s Hope for Peace),” is twelve minutes of Ono squawking, chirping, and yodeling over guitar feedback. It is endless, and it is unlistenable; I finally had to turn it down to a barely-audible volume because it was freaking out my cats. The camerawork through the film is a little slipshod (we watch an entire verse of “Dizzy Miss Lizzy” with the top half of Lennon’s face just out of frame), but they do capture one amazing moment. About halfway through the interminable final number, the cameraman pushes in on Lennon’s face, which is strangely vacant and unreadable in light of how completely the performance has gone into the toilet. What was he thinking? Did he actually think this was good? Or was he so in love with Yoko that he didn’t care—she was going to perform for twenty minutes, audience be damned? When it finally comes to an end, he leaves his guitar against the amp, continuing the feedback hum; as the musicians leave the stage, if there’s any applause at all, you sure can’t hear it. The viewer is left with an odd feeling as the closing credits roll—what started as a rip-roaring rock show ends as a peculiar psychological puzzle. It’s hard to cast a definitive vote on a package as uneven as this one; the first half of the program (the performances by the fifties legends and the Plastic Ono Band covering the rock classics) is five-star, must-have stuff, but as Ono is inexplicably allowed to take over the set, it gets progressively worse and worse, and the last twenty or so minutes are unremitting. So I’m on the middle with this one; it’s worth watching, particularly for fans of Lennon and classic rock, but when Yoko pops out of the bag, the good parts are done. 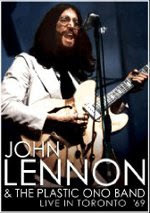 "John Lennon and the Plastic Ono Band: Live in Toronto '69" hits DVD on Tuesday, July 23rd.